Aloe walls and a starry ceiling...it was exactly where I wanted to start because I knew Tyler would love it. And stars are sweet and childlike without being indicative of any gender. 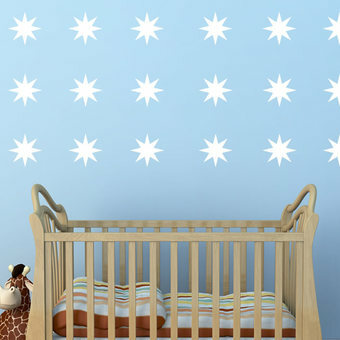 I found 8-pointed wall decal stars here...initially I was bummed thinking they just came in this large size. But no! They come in a 2" size in gold metallic. Done and done. 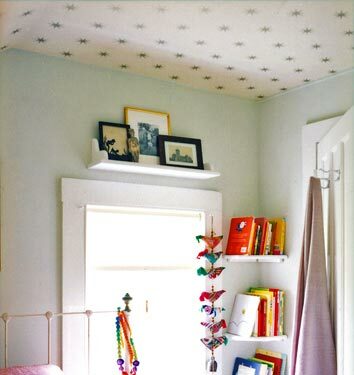 The room's ceiling is already white so this should be an easy afternoon project for us (read:Timmy) to knock out. I'll let you know the success factor. Daniela I do love using starts in a childs room; they are just so magical and dreamy! I just linked to your other great DIY for fabric walls on my blog!